Red. It’s the color of love and blood, and it’s the color I’ve always thought was best personified by this dude; a confused meathead spinning his wheels, yelling the dumbest thing possible. Lightning Bolt! Lightning Bolt! Lightning Bolt! As time has passed though, I’ve softened a bit on red and her place in Magic, and come to appreciate a color that has to get a lot done without creatures. Or enchantment removal. Or draw. Or interesting tribes that aren’t dragons. It’s a challenge to play red, and I respect that. 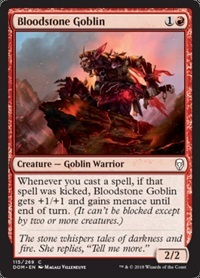 Bloodstone Goblin is better than Goblin Hero. That doesn’t make it good, but i’m going to note that, because Goblin Hero was once a rare. So why am I wasting time on this card? Well, because Hallar, the Firefletcher is a thing and, not counting Dominaria, they only have 24 legal cards to promote their ability. That’s dire enough that Bloodstone Goblin might make the cut particularly given their interaction with additional kicker spells. 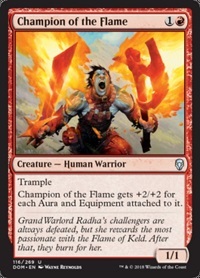 Champion of the Flame is really strong, but I’m not sure where it goes in EDH. Sure, it’s a excellent backup wincon in Uril, the Miststalker decks, but do you want a slot occupied by a card that you’ll only be attaching auras to in the event your commander is unavailable and won’t be for the foreseeable future? I don’t think you do, but maybe. 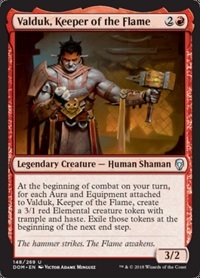 Is there some Naya enchantress deck that isn’t built around suiting up the commander but instead random bodies in the deck like Kor Spiritdancer or Rabid Wombat? I’m not sure such a deck exists, but if it does it just got one more option. 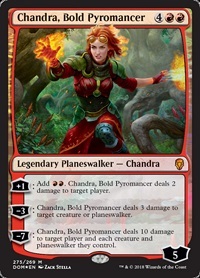 Chandra, Bold Pyromancer might have a home in a Chandra-themed deck, but like all the planeswalker deck walkers she’s probably too limited beyond that, especially at six mana. Fight with Fire is a card that exists. We did just have Fiery Fall costing us 5R for the same base effect with basic landcyling stapled on, and Magma Rift made you sacrifice a land at the same CMC, so I guess this is fairly efficient by comparison. Plus you can kick it to deal 10 to any amount of targets. As with Bloodstone Goblin this really might only be interesting to Hallar pilots, but since Hallar will get built by some number of people I’m noting it. 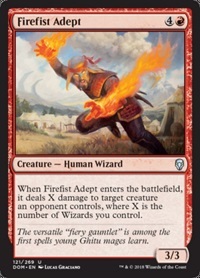 Firefist Adept could see some play in wizard tribal, particularly in Inalla, Archmage Ritualist builds built to abuse ETB wizard abilities. Removal strapped to a body is always nice, and it’s nicer when you get it twice. 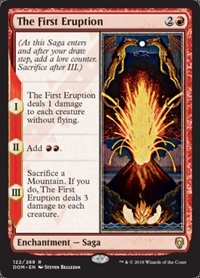 The First Eruption does three useful things, but are doing the three spaced out over three turns at static intervals that can’t be used proactively worth a slot in a deck? It doesn’t feel like it, particularly since it’s in colors that don’t lend themselves to enchantment recursion. The Flame of Keld is interesting. In an aggressive deck that empties its hand Chapter One might be meaningless, or in a madness deck or reanimation build it might be desired. Drawing two cards for Chapter Two is always good, as is a damage bump from Chapter Three. 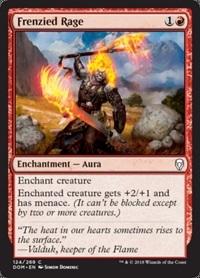 Frenzied Rage might make the cut in a Uril list, or that hypothetical Naya deck I mentioned earlier that may run Champion of the Flame. 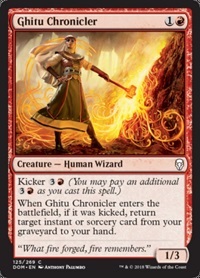 Ghitu Chronicler is another red wizard with an ETB ability and also has a kicker cost meaning it might be interesting to both Inalla and Hallar. Six mana seems like a lot for a red Archaeomancer, however, but sometimes redundancy is worth it. 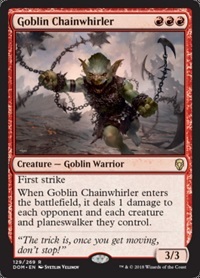 Goblin Chainwhirler is going to be an effective card in Standard, but triple red isn’t ideal, and the effect is less impactful in EDH than in other formats. It may get a slot in budget goblin lists, or in a deck like Kiki-Jiki, Mirror Breaker that can copy it and is probably running Panharmonicon and Conjurer’s Closet already. 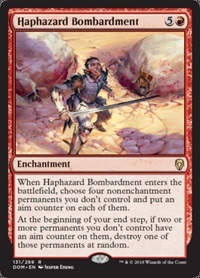 Haphazard Bombardment gets around hexproof or shroud which is nice, but I’m not sure that offsets the fact that the destroyed thing is determined at random, and that it might take a few turns to happen. Still, there are people who like randomness so this might be their huckleberry. Jaya Ballard is decent, but is she decent enough? She feels most at home in a spellslinger build that can use her +1 to cast extra spells, but those decks tend to be either U/R or U/B/R and thus don’t need her second +1 nearly as much. Triple red is also a bigger challenge in two and three color decks. She also doesn’t protect herself, which isn’t ideal. 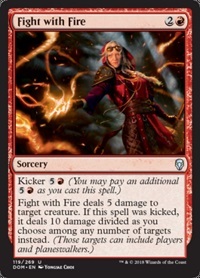 In mono-red however, the second +1 can be card advantage, and that’s rare in the color so presumably that’s where she’ll shine. I’m just not entirely sure what deck she’ll shine in. 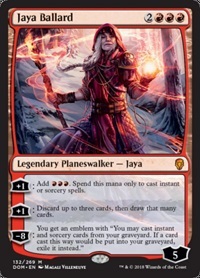 Jaya Ballard, Task Mage perhaps. Outside that she feels like a good card that just might not quite have a home. 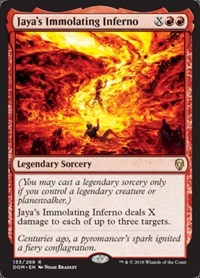 Jaya’s Immolating Inferno is red’s legendary sorcery, meaning you need to have a legendary creature or planeswalker in play to cast it. That’s much easier in commander than other formats. So how legendary is the Inferno? Well, it’s a pretty effective way to kill multiple people simultaneously in a mana producing deck like Neheb, the Eternal. I do think it’s probably limited to that kind of deck, but that’s perfectly okay, and the decks where it’s going to work, it’s going to do work. 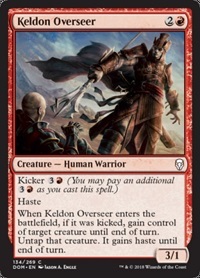 Keldon Overseer is another kicker card for Hallar, and maybe a theft option for something like Brion Stoutarm. It’s weak given the cost to make it happen, but it could show up. 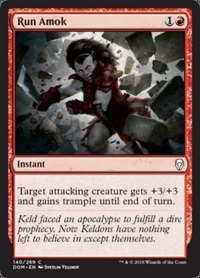 Keldon Raider gives you a little card quality improvement on a body that might have a home in a warrior tribal deck but even that seems unlikely. 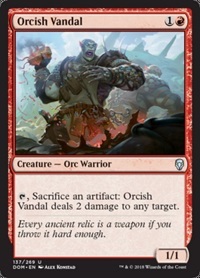 Orcish Vandal lets you turn an artifact into a Shock. That seems pretty narrow, particularly since it’s once a turn and hard to abuse, but some people want all the artifact sac outlets they can get. Plus, orc. Run Amok might have a home in Zada, Hedron Grinder, but that’s really its only EDH application short of maybe going on an Isochron Scepter in some strange Anax and Cymede build, and even that seems wildly unlikely. 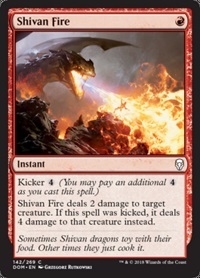 Shivan Fire is another kicker that might find a desperation slot in a Hallar deck, and that’s really it. 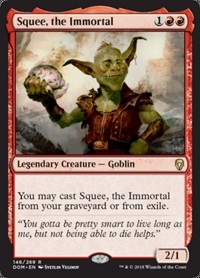 Squee, the Immortal isn’t R/G so it’s harder to combo him with Food Chain, but people will do it. He’s a weird and interesting card and commander that lends himself to both combo builds as well as sacrifice decks that want the ability to reuse the same body over and over, a la Reassembling Skeleton. You’ll also never have to pay the commander tax on him which is nice, and if your deck runs Skullclamp Squee is a repeatable on-demand draw two for four mana, which is exceptional in Boros or mono-red. 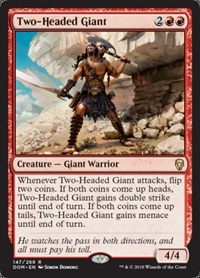 Two-Headed Giant is another chaos/coin-flip card for people into that kind of thing. 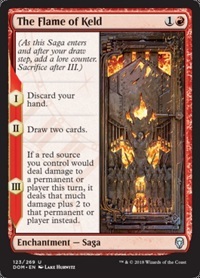 Valduk, Keeper of the Flame would be so, so good in R/G where you have access to Doubling Season and Parallel Lives, but in mono-red he’s also kinda interesting. For starters, he’s a decent backup plan in your Godo, Bandit Warlord or Jor Kadeen, the Prevailer equipment deck. Solo he winds up being a variant on Kemba, Kha Regent whose tokens have haste and evasion, and that still happen when you equip Valduk during your first main phase. The tokens can be saved via a well-time Sundial of the Infinite, they draw you two cards for one mana off a Skullclamp, and they interact nicely with Shared Animosity. If you are able to deal damage successfully, something much easier thanks to trample, two tokens form a combat damage loop with Breath of Fury. That’s a lot in Valduk’s advantage, and though he will show up in fewer decks than Squee he still should show up in more than a few lists, and atop some as well. 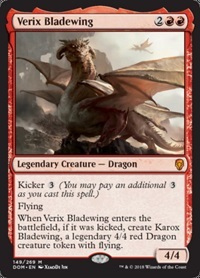 Verix Bladewing is absolutely going to wreck face in Limited, and it makes for an actual good enabler for Hallar. As a commander, eight damage for seven mana is fine, though it’s scattered between two bodies, and only half of it is actual commander damage. It’s a fine card that just doesn’t necessarily have a home as a commander. 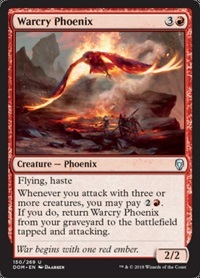 Warcry Phoenix will someday have a home when they print a phoenix legend that gives phoenixes +1/+1 and deals a damage to each opponent whenever a creature is returned from your graveyard to your hand or play, but today is not that day. Or this week. Or probably this year. Or decade. 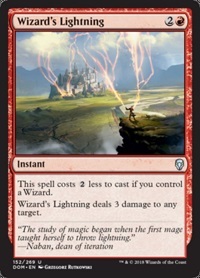 Wizard’s Lightning is another Lightning Bolt in a wizard deck, or even a deck whose wizard commander will be in play more often than not. The problem is Bolt is currently only in just over 7,000 decks on EDHREC. It’s only the 20th most played red card in the format, and while that may make it underplayed, it also means there’s not a lot of decks that are screaming for a conditional second copy. Still, those that want it, want it and will welcome a second provided they can reliably have a wizard on board. That’s where we’re gonna wrap it up with red. There’s some really solid stuff here, and a bit of chaff, but this is also a set with a lot of multi-colored home runs that are being reviewed elsewhere. So what do you think of mono-red’s additions to the pantheon? Sound off below.